Spitsbergen and North East Greenland - often visits Viking Bugt see photo opposite. The Vulcanologist's Dream - visits Reynisfjara where columnar jointing can be seen on the beach. Ocean Crust and Mountains of Mantles - while strictly speaking these are not columnar joints, this trip visits the 'Geotimes' pillow basalts of Wadi al Jizzi. 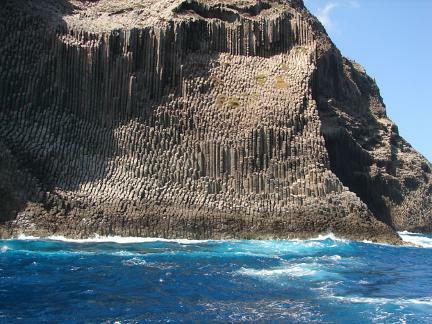 The Birth of Geology - visits Fingal's Cave on the Isle of Staffa. Yellowstone, Dinosaurs and Grand Canyon - visits Sheepeater Cliff in Yellowstone National Park. 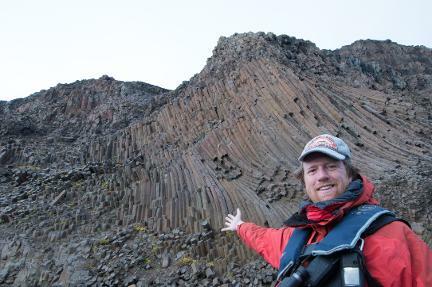 James Cresswell with columnar jointing in Viking Bugt -Greenland.